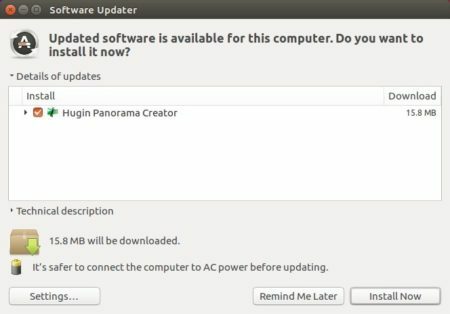 The Hugin panorama photo stitcher has reached the 2017.0.0 release. The official Ubuntu binary packages are now available via its PPA repository for Ubuntu 14.04, Ubuntu 16.04, Ubuntu 16.10, Ubuntu 17.04, Ubuntu 17.10, and derivatives. Hugin is an easy to use cross-platform panoramic imaging toolchain based on Panorama Tools. With it, you can assemble a mosaic of photographs into a complete immersive panorama, stitch any series of overlapping pictures and much more. Fixes handling of masks in cpfind when images needs remapping for cp finding. Sometimes unsaved changes were disregarded without asking the user. Unsaved changes should now always require user confirmation. Added special assistant variant for single image projects. Display of final panorama dimensions on stitcher tab. Other small improvements and translation updates. 2. 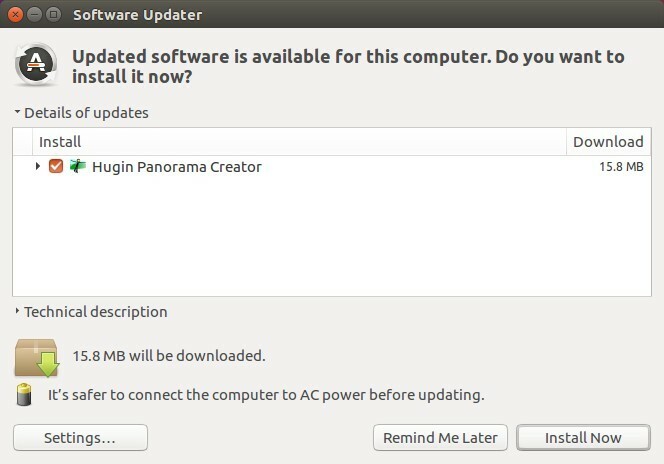 Then launch Software Updater and upgrade the software after checking for updates.